﻿﻿﻿Michael was born in Los Angeles to Cuban and Dutch parents. Raised in Southern California and the Netherlands, he attended Occidental College (Los Angeles), where his coursework included studio art classes, and Tufts University (Massachusetts). He currently lives and works in Washington, DC. In college, Michael began as a sculptor, under the mentorship of the late George Baker. Starting with making numerous maquettes out of strathmore cotton board, Michael eventually focused on wood and metal. He played with three-dimensional geometric shapes and assembled them in sometimes meticulously planned ways and other times haphazardly. Once he realized that band-saws and welding equipment would be impossible to afford, let alone house, after graduating from college and leaving the campus sculpture studio behind, Michael took an introductory painting class taught by Linda Bessemer, which set him on the course to where he is today. He has since taken several painting classes at the Art League in Alexandria, Virginia. Michael's paintings inherited the use of geometric forms from his sculpture. His works are compilations of geometric forms intersecting each other or running side-by-side. What his paintings lack in a physical third dimension, they gain in color -- bright, bold colors to balance geometric forms against each other. While in Washington, Michael was a member of Mid City Artists and the Triangle Artists Group, a loose collective of Washington/Baltimore-area queer artists. 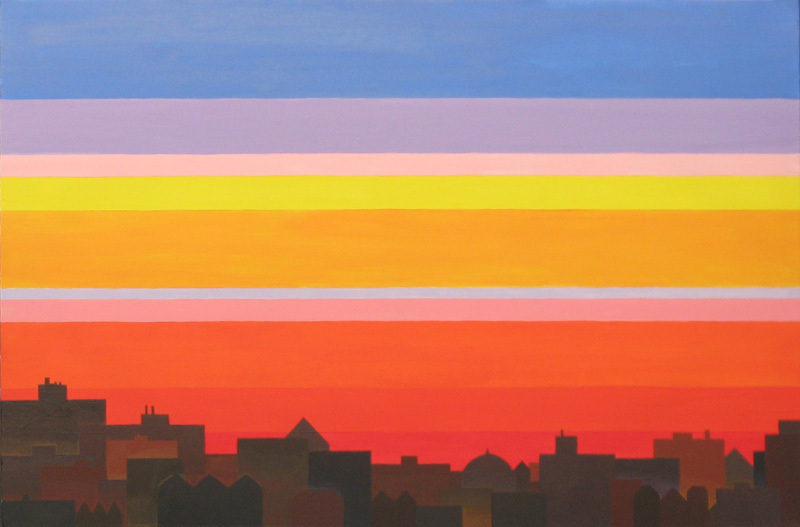 "My two favorite artists shared a Color School meets urban landscape sensibility ... Michael Torra's monochromatic city skylines pop against a backdrop of bold, colorful lines."